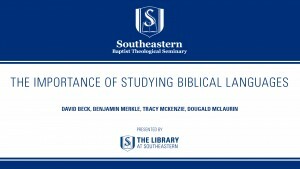 David Beck, Benjamin Merkle, Tracy McKenzie, and Dougald McLaurin, come together to discuss the importance of biblical languages. 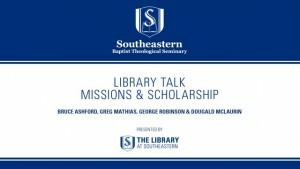 Bruce Ashford, Greg Mathias, George Robinson, and Dougald McLaurin come together to discuss how to use your scholarship effectively for the Kingdom. Chuck Quarles, Nathan Finn, Matthew Mullins, and Dougald McLaurin discuss how to develop the habit of writing.